What is the Fluid Secreted by Millipedes? Millipedes are peaceful creatures, usually content to scour the dark parts of forests and gardens, looking for plant matter and organic debris to eat. They aren't fast animals, and while they are covered with a chitinous exoskeleton, this provides relatively little protection from the strong jaws of some predators. However, millipedes are not helpless; rather, they have chemical weapons at their disposal and they don't hesitate to use them on would-be predators. One of the major arthropod lineages, the roughly 8,000 living millipede species make up the class Diplopoda. Though they inhabit all non-polar areas of the world, millipedes must live in damp microhabitats to avoid desiccation. To this end, many species engage in burrowing or subterranean lifestyles, and move about on the surface only during cool and damp weather. Most millipedes have paired glands near their legs that discharge foul-smelling, unpalatable or toxic chemicals. Millipedes reproduce by depositing eggs, and some species protect the eggs from dangers. Different millipede species produce secretions with differing chemical compositions. In most cases, the secretions are composed of numerous chemicals, each serving a different function. Some of the chemicals produced by various species include hydrogen cyanide and hydrochloric acid. In many species, the chemicals produced are foul-smelling, but not dangerous. It's difficult to make generalizations; however, some millipedes secretions produce reactions in humans. Handling should be avoided when possible; if it's necessary, handling should be followed by vigorous hand-washing with soap and water. Some of the compounds are known to burn the skin or cause discoloration lasting more than a month. Care should be taken to avoid getting millipede secretions in mucous membranes, such as the eyes, nose or mouth. Some species are capable of discharging their secretions with considerable force, squirting them up to several feet. Black lemurs (Eulemur macaco) living in Madagascar use the powerful secretions of the local millipedes to their advantage. Periodically, the lemurs will capture a millipede. 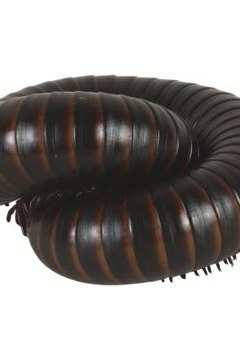 The millipede then rolls into a protective coil, shielding its vulnerable ventral surface, and begins to emit its poisons. If the millipede requires prodding to discharge its fluids, the lemur will shake, bite or otherwise harass the millipede until it produces the desired effect. The lemurs will then coat their bodies in the secretions of the millipede; working as an insect repellent, the fluid helps to reduce the number of ectoparasites that bother the lemur. Science: Secretion of Benzaldehyde and Hydrogen Cyanide by the Millipede Pachydesmus Crassicutis (Wood).